Helllllllllllllo beautiful people. I have missed chocolate chip cookies. They are very nostalgic for me. My mum always made the best ones and my favourite time to eat them was immediately out of the oven, with a small glass of milk. 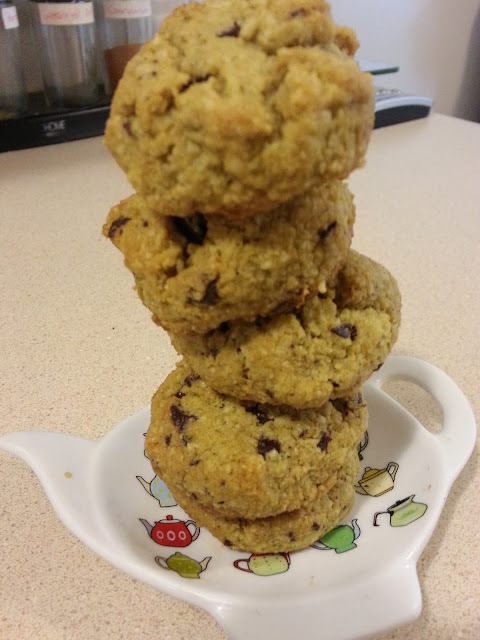 While I no longer ask my mum for home made chocolate chip cookies, I now know how to make my own... and much healthier! (though, missing that mother's love element...). 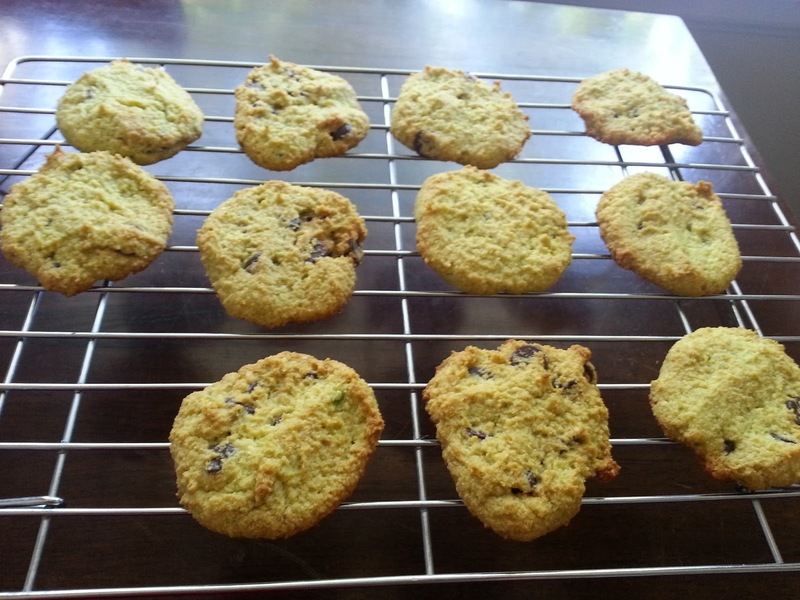 I am sharing this recipe because 1) avocados are a new discovery for me, having never in my life tasted one until 2013, and 2) chocolate chip cookies. These taste incredibly like "regular" chocolate chip cookies! They don't bake hard, like store-bought cookies. They bake super soft and stay soft, and taste great dipped in hot tea or coffee. 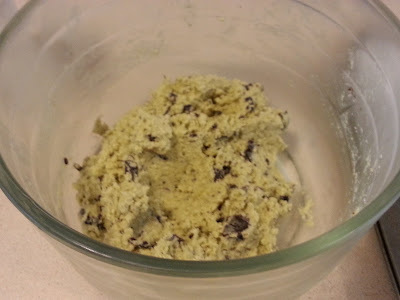 Even the dough is remarkably similar to any chocolate chip cookie dough I've tasted. I have had 8 people taste-test these cookies, and two have called me to ask for a batch. My mother, though she does not like sweetener even slightly, approved of them (but doesn't want more because the after taste of sweetener is strong for her). She has, though, asked me for the recipe so that she might make them for my step-dad. My dad wants a whole batch to himself. My brother, his GF, and her sister all loved them. And of course... My BF wants all baked goods all the time. Needless to say I am very confident in this recipe! 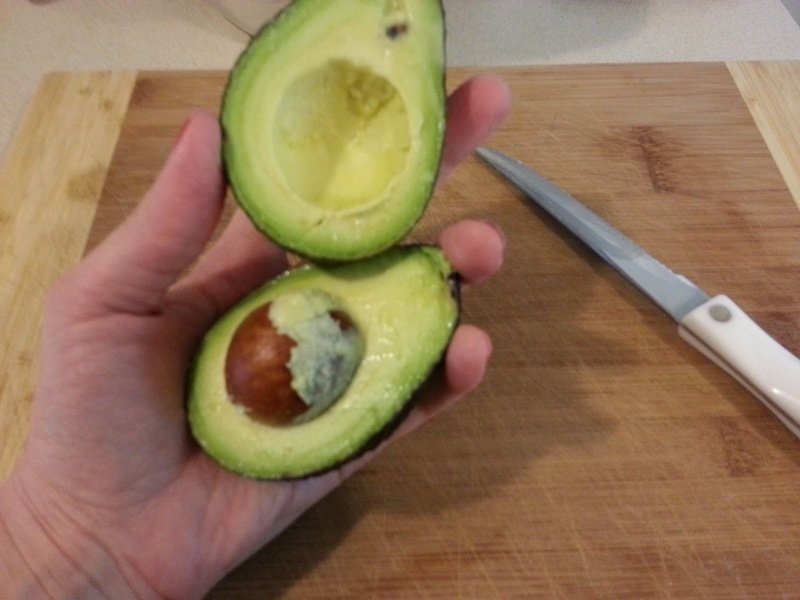 Oh I would also like to prepare less experienced avocado-ers. 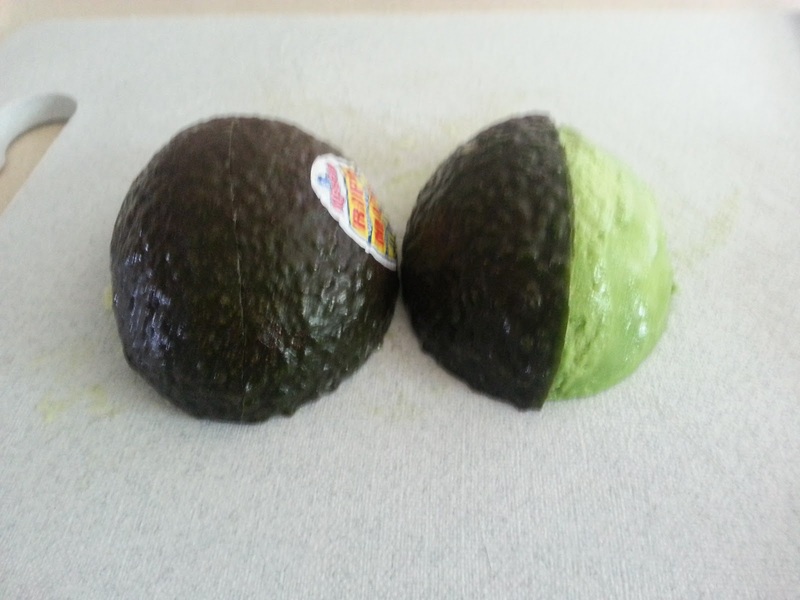 Avocado, when cooked/baked/generally hot, has a weird and odd aftertaste. If you eat a cookie fresh out of the oven (admit it, you also love doing this. I know I'm not the only one), you will notice this slight taste. 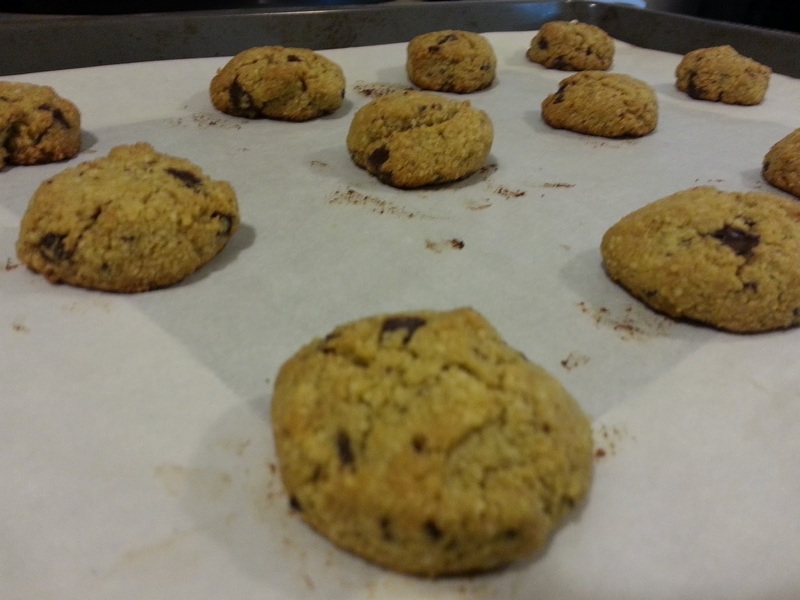 Once the cookies cool, the aftertaste disappears, and you may proceed to consume. *Remove the pit before weighing. 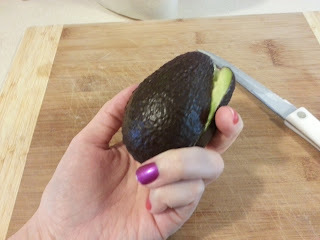 The ones I buy tend to be pretty small, and one avocado without the pit is generally 80-110g. 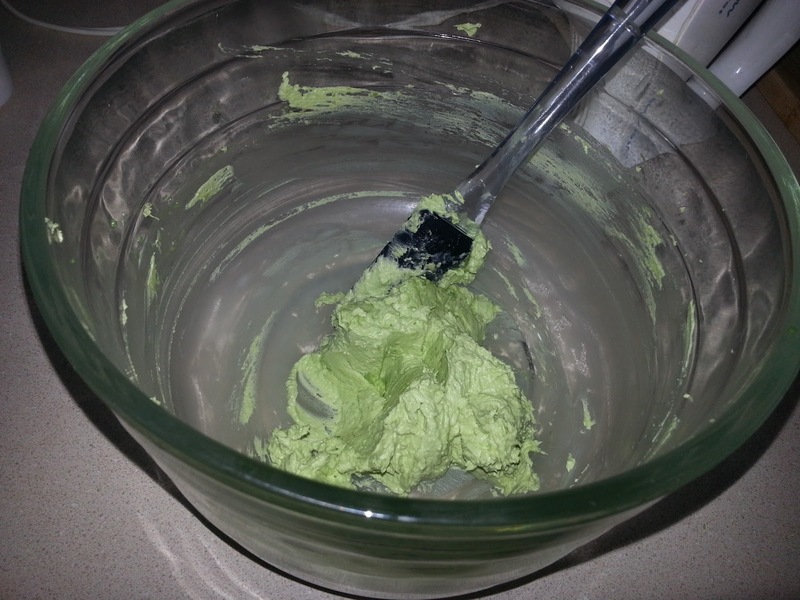 For this recipe I used 1 and 1/4 avocado because my first one was only 74g. If your avocado is only a few (i.e. 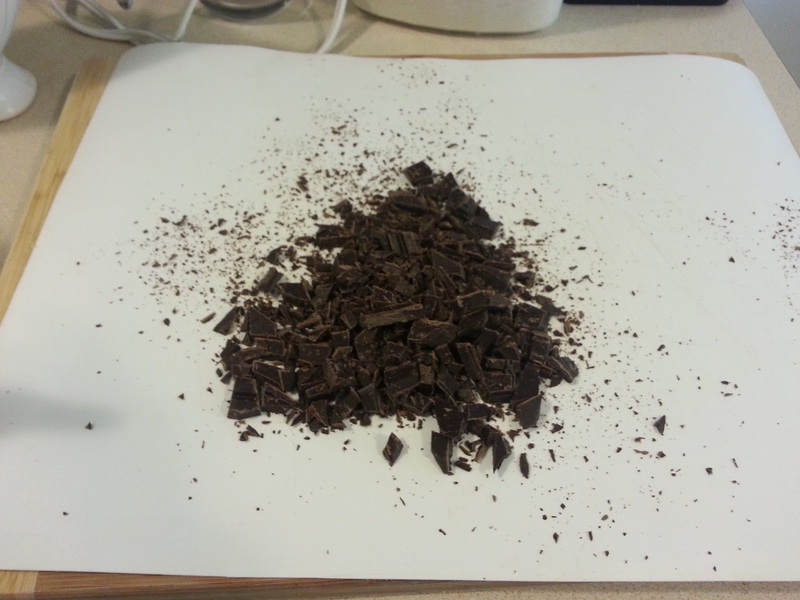 5g) above or below 100g, that is fine. Also, any breed of avocado will work. **You can use salted butter. If you do, omit the salt required by the recipe. 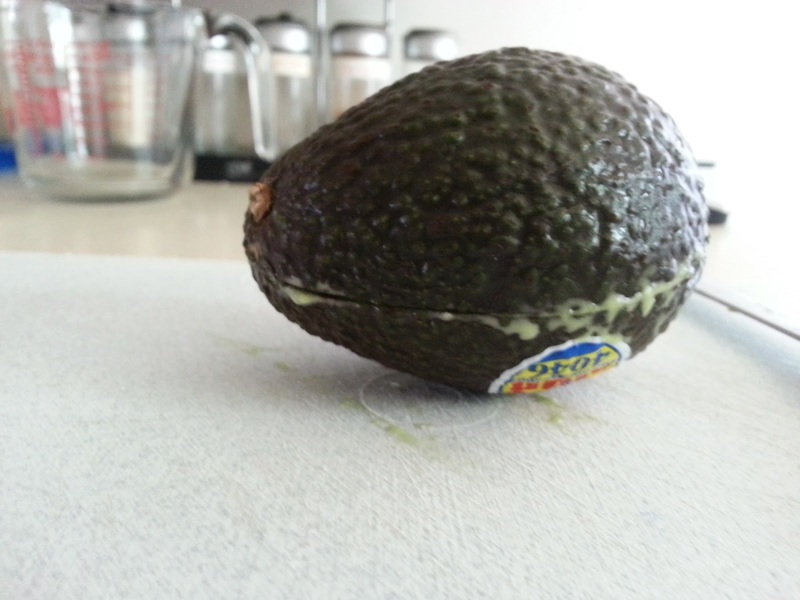 The first thing we're going to do is work on your avocado. I have some pictures to show you how to "peel" an avocado, or you could just scoop and scrape the avocado meat from the rind. For either method, the first step is to cut so it can be pulled apart. Start at the stem and cut long ways, to the bottom. Make sure to cut right to the pit. 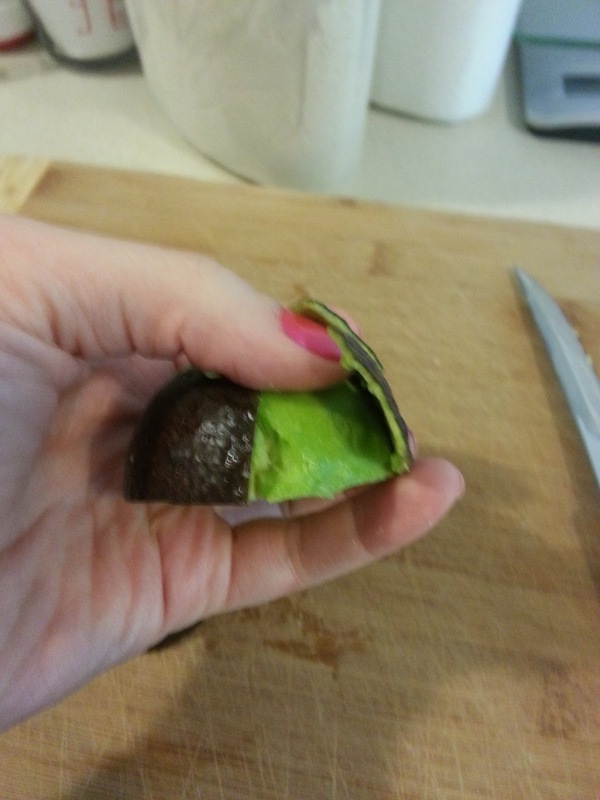 Once cut, you should be able to twist apart the two halves (like we all USED to do with Oreos). 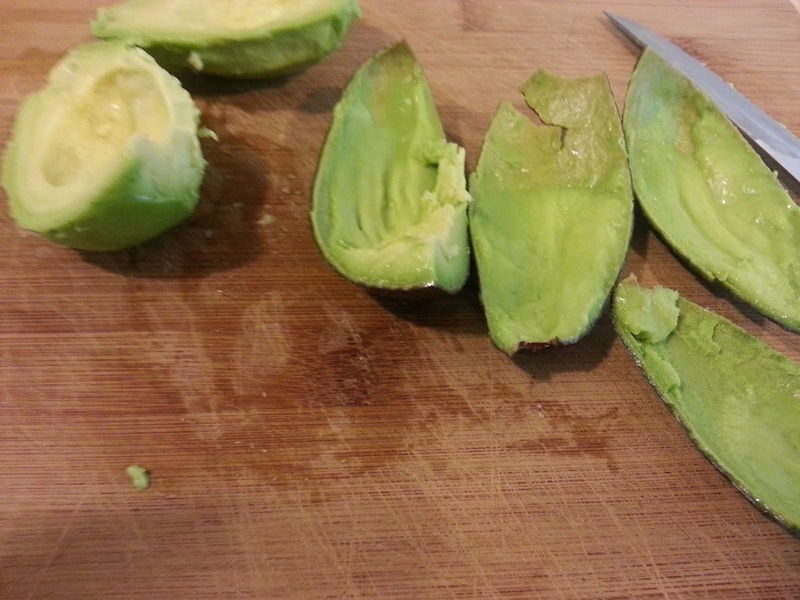 This is easier the more ripe your avocado is. Now you'll want to remove the pit. The pit is pretty soft so a good technique is to press a knife into it and lift/wiggle it out. If you don't want to risk slipping and cutting yourself, you can slip a spoon under the pit and try to pop it out that way. ... Peel your avocado :D. I prefer this method because my avocado pieces usually look really nice after. For this recipe it doesn't make a difference, but I'll show you anyway. Basically, start by scoring the rind on the two halves of the avocado, long ways. I only put one score on each but you can do multiple to make peeling easier. You should be able to use your fingers to separate the rind from the flesh. I typically can pull this off just by slipping my thumb under the corner and pushing back slowly (a spoon would also work). Oh well. Like I said, it doesn't make a difference for this recipe. Okay, great. Now that the avocado is ready, put that with your butter in a medium mixing bowl. You can cut the butter into cubes or pats to help it blend a little easier. Mix these together until creamy. Next, add the egg and vanilla. Mix thoroughly. Add the granulated sweetener gradually as you mix the other things. Okay now we add everything else... but not all at once! First, all the almond flour and 1/4 cup of coconut (that is half what this recipe calls for), as well as the salt (if using), baking soda, and baking powder. Mix these ingredients on low until everything is incorporated. Next add the chopped chocolate chips and the other 1/4 cup of coconut. Mix these together with a spoon or spatula, not the mixer. 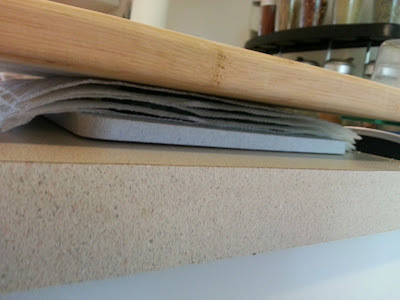 I have this wonderfully cheap flexible "cutting board". It isn't silicone or anything, but it is marvelous for chopping and pouring things with minimal mess! Okay, everything's mixed and ready to go, right? Wrong. Now we chill the dough. Okay we don't have to chill the dough, but I find that the cookies are easier to form and also bake better when the dough is cold. Skip chilling if you are as impatient as I often am. If you want to chill the cookie dough, just pop the whole bowl as-is into the fridge or freezer for about 20-30 minutes. Also preheat your oven to 325F. This is a great time to clean up the mess you made. 30 minutes is up? Not yet? Okay during the last minute or so, line your cookie sheet with parchment paper. There is no need to grease the paper, but if you feel better doing so, go right ahead. 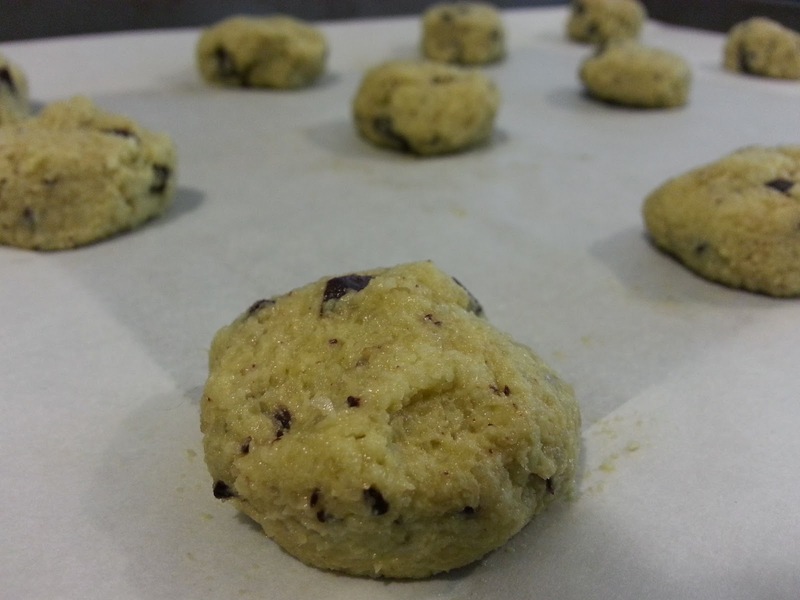 Make ball type shapes out of the cookie dough, and press them down gently. This recipe should make 24 cookies (or 23 if you ate the equivalent of 1 in raw cookie dough, as I did...). Also, these cookies don't "fall" or spread like "regular" cookies do, so if you only slightly press down the dough balls, your cookies will be very round. For flatter cookies, press flatter (obviously). Bake 12 cookies at a time for 17 minutes. This is the perfect time for you to take your cats outside for a quick frolic on the patio. Also to get pissed off that your cats don't respond to their name when they are outside (even though they do inside!). Also to get especially irritated when you try to bring them in, and one basically yells "JUST KIDDING" as he pretends to run inside, then proceeds to hop the neighbour's fence. Pfft. Leave him there... You have better things to do. Like assemble a vacuum. Or contemplate making another batch of cookies. Or a grocery list. Or a list of lists you should make. When the cookies are finished, move them to a wire cooling rack. Let cool. Consume. Enjoy. Or consume one while it is incredibly hot, curse about how hot it is, but enjoy how melty and soft it is. Helllllllo. It's been a while. Again. Let's face it... This blog has to be put on the back burner when it comes to school and work also being on the list :(. But anyway. 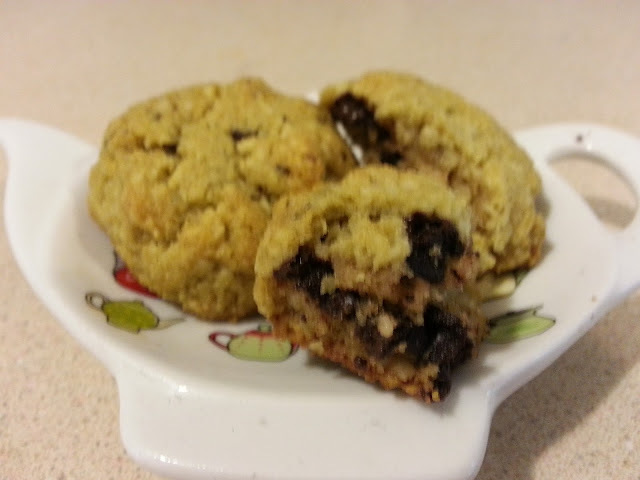 I was going to post avocado chocolate chip cookies today, but my friend thought these were a better option. So here is a savoury treat for your taste buds. These rolls really melt in your mouth. 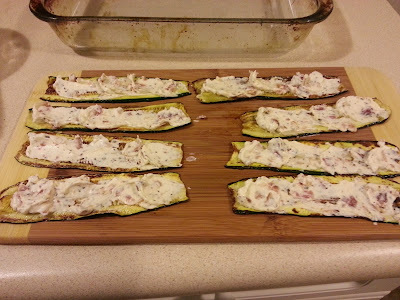 The soft zucchini slices combined with the cheese and spices make a great appetizer or side. The rolls I made were jam-packed with flavour. I loved it, but the BF isn't really into fancy spices... or cream cheese. So if you don't like cream cheese, shame on you! Just kidding. You could use any cheese, really. I would like to make these with goat cheese next... mmm, my favourite! If you don't like a lot of spices, or only really like one particular one just use that. I don't like to include spice measurements in my recipes. 1) I'm not very herb/spice savvy... 2) I don't always use the same spices, or same amounts, for one recipe, and 3) I know some people just really love garlic and prefer to use that. Our go-to spices are garlic, chili powder, and seasoning salt. 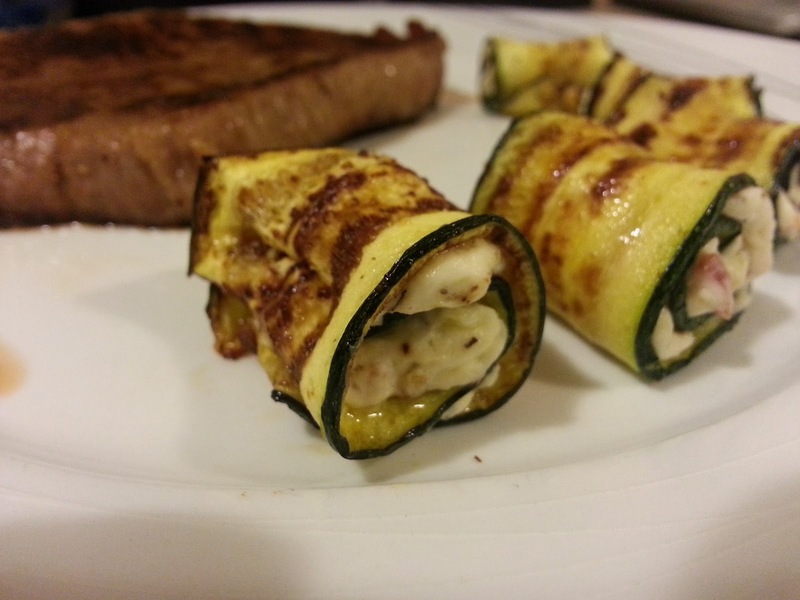 For this recipe I sprinkled garlic and a tiny bit of seasoning salt on my zucchini slices while they were cooking, and added basil to the cheese. If you don't know what to do about spices you could buy flavoured cream cheese and let Kraft do the work for you. These nutritional values listed do not include bacon or butter/oil. * I mixed bacon bits with the cream cheese because I already had them made up from a previous meal. Other possible variations: diced cherry tomatoes, chopped olives, garlic pieces, diced jalapeno peppers, chopped red or green onion, salsa, roasted red peppers, etc... Be creative :). 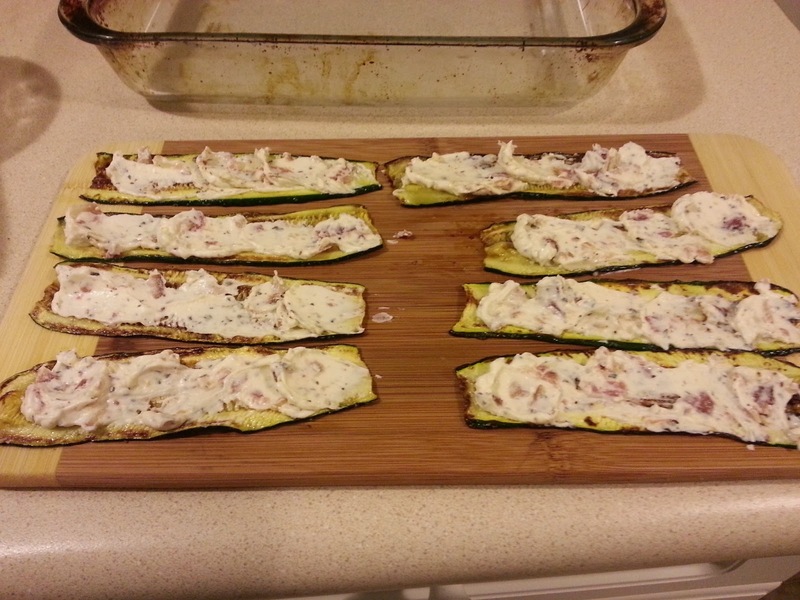 Start out by prepping your zucchini. 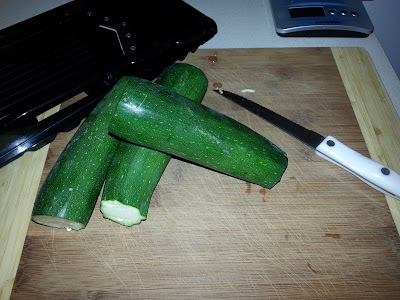 Chop the ends off each zucchini and discard. Slice each zucchini using your mandolin slicer or similar tool. If you don't have such a tool, try to make the slices about 1/8th of an inch thick. Discard (or eat... or save) the slices that are entirely skin on one side. Wipe each slice with a paper towel, then move on to step 2. 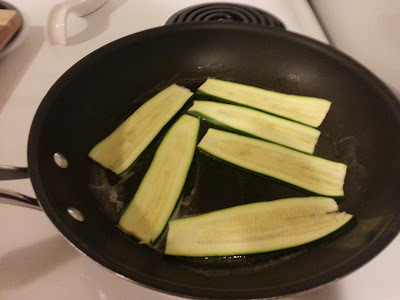 I am processing 3 zucchinis, but am definitely not using all the slices for this recipe. I need the other 16 slices for things. I got 24 slices total so that's 8 slices each! While the zucchini is drying out (or when you're just about ready to work with the zucchini) go ahead and mix your roll filling. I forgot to take my cream cheese out early to let it warm, so I ended up popping it in the microwave for 10 seconds, which did the trick. You want the cream cheese to be soft, so definitely either take it out early to let it reach room temperature, or warm it up in the microwave. If the cream cheese is soft it will be easier to a) mix it, and b) spread it. If you try to spread hard cream cheese on a slice of zucchini, you will ruin the zucchini... poor things are very fragile! Mix whatever filling (you can never go wrong with bacon bits!) you decided on, the parmesan cheese, and spices, with the cream cheese. Set this aside. Preheat either your frying pan, or grill, to about medium in order to get ready for the zucchini slices. I used a 12 inch frying pan because my G.F. grill is still packed (and we don't have a BBQ anymore...). Drop some unsalted butter, or oil, into the pan. 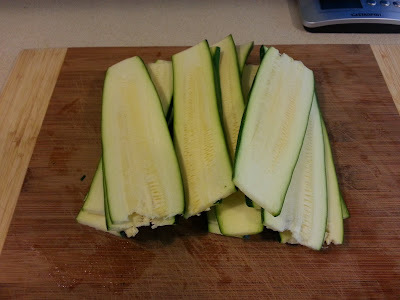 Remove all pieces of paper towel from the zucchini slices. Wipe each side of each slice to remove excess water. Once the pan is nice and hot, lay your slices of zucchini in it, browning each side (this took about 5ish minutes for each side for me). 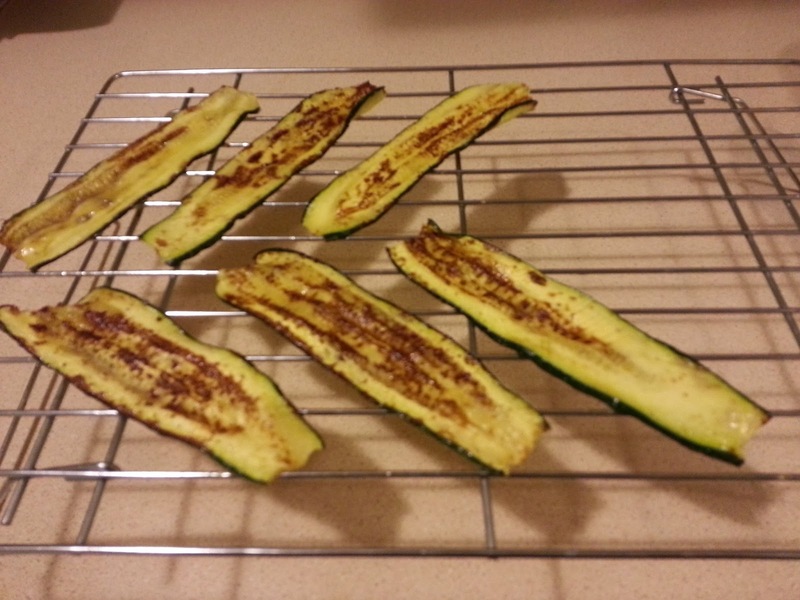 Lay your fried/grilled zucchini slices across a wire cooling rack until they are cool enough to work with. Once cool, proceed to smother each slice with the filling you've mixed up! Then roll each slice, starting with the thinner end, and serve. I ended up popping mine in the oven as I wanted to serve them hot with our steaks. 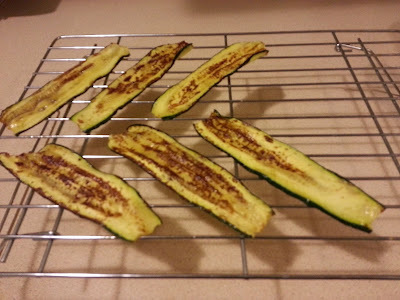 So I started preheating the oven to 350F while I was frying the slices of zucchini. I left them in the oven for about 10 minutes and served them.